Hutton Home – WHAT IS JAMES WEARING? I love using Louis XVI style furniture. It has such a fluid, clean line – almost modern in feel. Perhaps this is why design from this period mixes so well in settings where there is a both modern furniture as well as antiques. 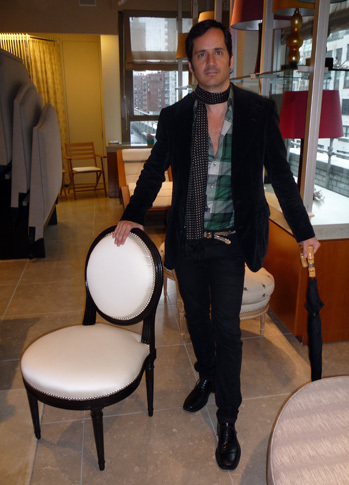 Here at the very chic Sutherland Showroom in New York City I am admiring a Louis XVI style “Comedie” chair by Hutton Home – part of the Pierre Collection. These chairs are made in France by one of the factories that made some of the furniture at Versailles. On a rather rainy day, I am wearing a Gucci black corduroy jacket, bold green plaid cotton shirt by Gucci, Diesel black skinny jeans, (another great choice for rain or snow as denim does not lose it’s shape in the rain), silver chain link belt by Gucci, a black and white silk polka dot scarf by Ralph Lauren to add a little flare, English style lace up shoes by Gucci to keep my feet dry, and a custom made umbrella with bamboo handle by the legendary Swaine Adeney Brigg – this company has been around since 1750 and it goes without saying that their umbrellas are exquisite.